Home Basic Date Questions Date Interview Questions How to display time in 12 hour and 24 hour format in Java? Write a program in Java that display current time in 12 hour and 24 hour format. How to convert Date to String ? * @problem How to display time in different formats? // Creating Date class instance. Output - How to display time in different formats in Java? 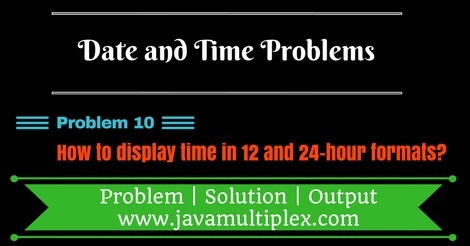 Tags : Date and Time Problems, Display time in different times in Java, Solution in Java, String, DateFormat, SimpleDateFormat.